If you are a WordPress developer/designer, you have to work with various types of clients. So, you need to build different types of websites. It can turn hectic as you go on. In that case, multipurpose theme can make your work easy. Multipurpose themes are single web template that suits all types of websites and brands. Usually, they come with all the features a primary site has like creating professional portfolios, promoting products and services, collecting leads, supporting eCommerce features, and much more. They are responsive too. You can use multipurpose themes to create any kind of website you want. They can turn your website from a regular blog to a professional marketing platform. Right now, multipurpose themes are prevalence and common thing among WordPress developers. Due to massive popularity, there is no shortage of multipurpose theme in different marketplaces like ThemeForest. So if you want to value your money while buying a multipurpose theme, this article will help you. 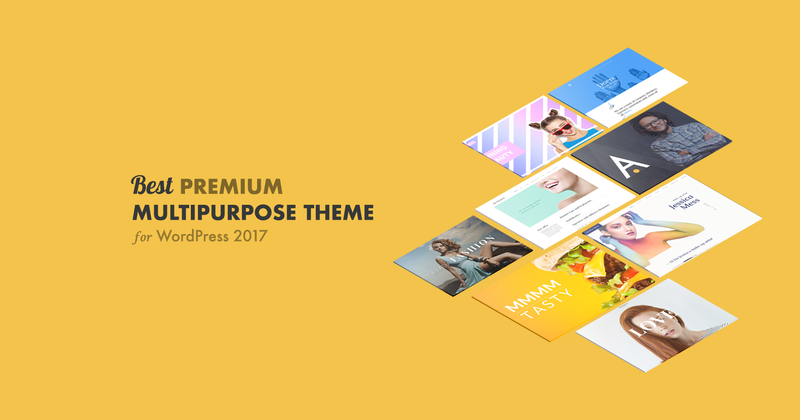 We have handpicked 5 best multipurpose themes, that will match your requirements, and value your money. We have considered how well code they are, and how versatile they are to enlist them in this article. That’s why you don’t need to worry about the quality while selecting one from the list. Let’s see what these themes have to offer for you…. The flagship product from Elegant Themes. Divi is the most popular multipurpose theme available in the market. The motto of this theme is ‘Sky is the limit.’ You will actually feel the power of Divi after installing it. The theme offers you unlimited customization features and exceptional functionality, the kind that can only be achieved through hiring a professional web developer. Divi includes one of the most powerful drag-and-drop web page builder Divi Builder. The builder gives you complete creative control over the layout to build a mobile friendly website exactly as you want. The advanced drag-and-drop builder helps you to create a visually beautiful website without coding a single line of code. Recent update of Divi offers split testing of your web content. Divi Leads allows you to conduct split testing to optimize different elements of your website and serve the best result possible. Avada is another familiar theme that will work for any of website you want to build. It’s the number one selling theme on busy ThemeForest marketplace for about one year. With this premium WordPress multipurpose theme, you can design anything from professional blogs and online portfolios to the agency or niche news websites. Endless customizations and lots of demos are the two main reasons behind the popularity of this theme. With the specific theme control option, Avada also provides a growing library of pre-built templates. Avada is packed with Fusion Builder and Fusion core plugin. Fusion Builder helps you to create custom page layouts, and to drop a broad range of elements into layouts. It also helps you to customize all of the demos and their pages. Works with popular plugins including WooCommerce, bbPress, Gravity Forms, Contact Form 7, etc. Themeco has come up with a new idea for the customization process of a theme. Instead of offering several basic layouts, they invented the concept of stacks. These stacks are basically separate designs, included in one theme. You will be able to choose from four of them at the moment, but once a new stack is available, you will get it for free. This attractive premium multipurpose theme provides you with four main categories of pre-built demos. Each category then contains multiple variations that cover a broad range of projects. So you can build any website you like with this multipurpose theme. X-theme includes one of the world’s best page builder Cornerstone. Cornerstone helps you to create visual layouts with the drag-and-drop user interface. So you have full control over building your website. Few days ago Themeco introduced X-Pro; an upgraded version of X-theme with some advanced features. Another prominent multipurpose theme for creating different types of website. Whether you are a business owner, a freelancer or a marketer Jupiter is perfect for your site. Currently, 60,000 people use Jupiter, and a won’t find the same looking one on the web. Across all professional and technical backgrounds, Jupiter fits without any flaw. Using Jupiter is easier. The powerful admin panel of the theme enables you to control all the customization options and functionality from one place. And the theme has earned 94% in Google PageSpeed & GTmetrix scores. That an unbeatable score! Also, you can showcase your merchandise, sales, and promotions with Jupiter’s shopper-friendly features. The last theme in our list is a truly versatile and biggest theme of them all. You will find 44 demos of this theme on ThemeForest, and that is quite impressive. It’s a tasteful and well-designed theme that you can use for constructing beautiful and fully functional websites. Over 50,000 happy clients use BeTheme on their website. The powerful Muffin admin panel allows you to customize the theme easily. You don’t need to write a single line of code at all. We know choosing a multipurpose theme is hard and overwhelming. With so many great options you might get a bit confused. If you are in doubt, think about your requirements, particular needs, and what the theme should offer to match your expectation and brand. This will help you to choose one. Multipurpose themes are best for various option and lots of customization option on a single theme. Above mentioned all the themes match this criterion. If you think we missed any other great theme that should be on the list let us know in comments.